Every golfer needs to have a good laugh every now and then, especially during a very serious game. This sport may seem simple to non-golfers, but the truth is, it is completely the opposite. The game is very hard to master. Over the years, golfers have experienced funny moments on and off the course. These experiences have been translated into the jokes, puns, and anecdotes that are now conveniently written for your pleasure. If you love golf, you will certainly find these 21 jokes that we have compiled for you absolutely hilarious. 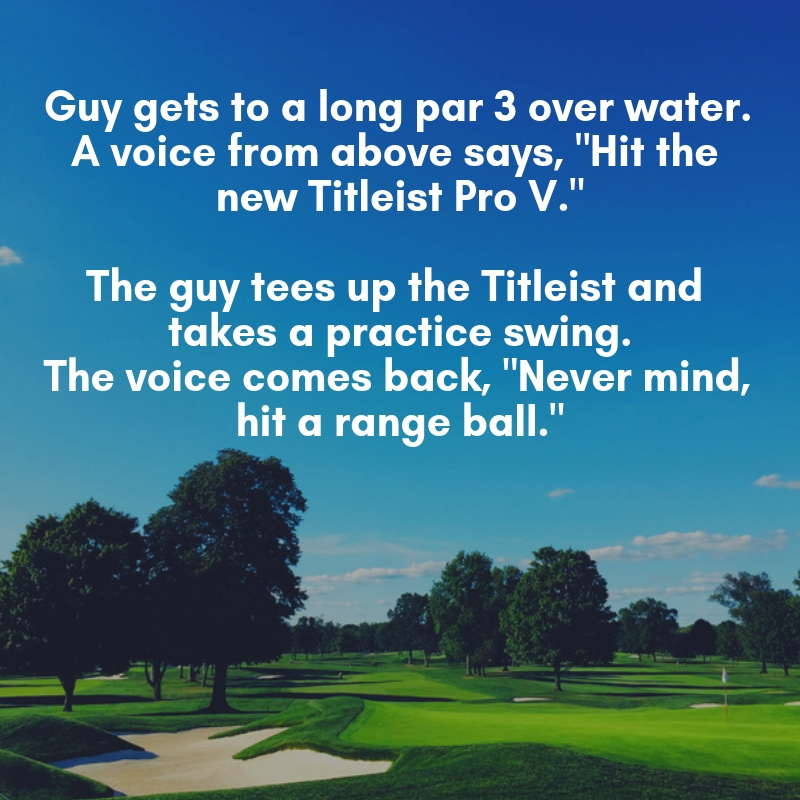 We even bet that after reading these jokes, you will share it to your golfer friends and have a few laughs while swinging your golf clubs. “I would,” the husband answered. A married couple played golf together everyday. One day the man and his wife were on the first tee of their local course. He was on the white tee and she was waiting in front of him by the ladies tee. He teed off and caught the ball perfectly; unfortunately it hit his wife smack in the back of the head killing her instantly. She fell face down on the tee, didn’t know what hit her. They had an inquest on the wife’s death, the coroner said it was clear how she died, she was killed by a golf ball, and that there was a perfect imprint of a golf ball on the back of her head. The coroner then went on to say that he was a bit concerned to find a ball inserted up the woman’s backside, and could the husband throw some light on this? Q: What is the difference between a golfer and a fisherman? 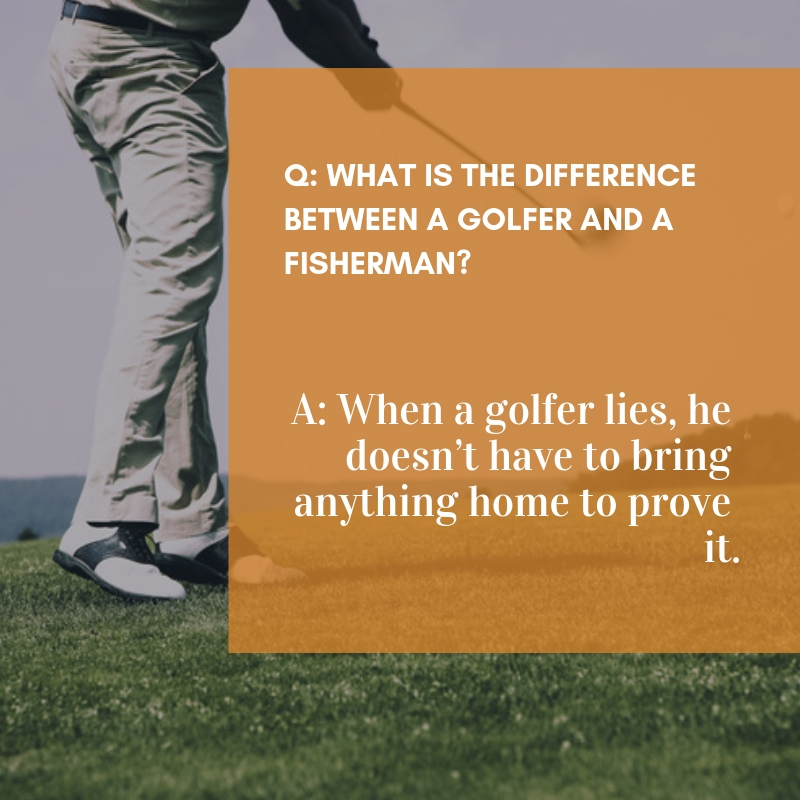 A: When a golfer lies, he doesn’t have to bring anything home to prove it. Two men ran out to the course for a quick nine after work. They get to the tee and see two ladies playing ahead of them. One of the men complains that the ladies will slow them down and says he is going to ask if they can play through. He goes halfway to the ladies and turns back. The guy tees up the Titleist and takes a practice swing. A hacker was playing so badly that his caddie was getting increasingly exasperated. “Eventually,” replied the caddie, wearily. Dan and Brandon are playing a spectacular new golf course built on very scenic terrain – cliffsides and gullies and ravines. The brush is terribly thick and tearing at Dan’s clothes. The sunlight is dimmed by all the overhanging branches and vines. But Dan keeps searching, and finally spots something shiny down below. As he nears the object, he realizes it’s not a ball, but a golf club. Dan takes a closer look only to discover that it is an 8-iron – and it’s in the hands of a human skeleton laying near an old golf ball! Q: Why do golfers always carry a spare pair of trousers with them? A nun is sitting with her Mother Superior chatting. “I used some horrible language this week and feel absolutely terrible about it,” the nun said. “When did you use this awful language?” the Mother Superior asks. “Is that when you swore?” asks the Mother Superior. “Is that when you swore?” asks the amazed elder nun. 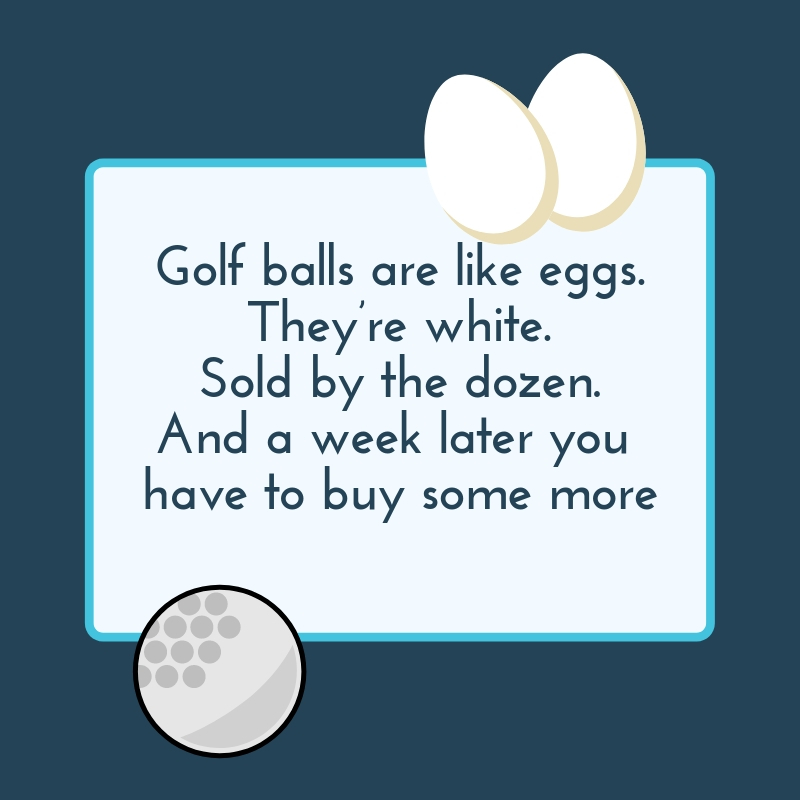 Golf balls are like eggs. And a week later you have to buy some more. Months go by and there’s no sign of rescue, and not even a soccer ball to keep him company. Then one day Bud sees a beautiful mermaid coming out of the surf, heading straight toward him. Bud doesn’t have to think about his answer. “You bet!” he nearly shouts. The mermaid opens the vest she’s wearing, reaches in and pulls out an ice-cold beer. Then she asks, “Would you like a cigar?” And Bud quickly answers, “You bet! Bob was a religious golfer. Every Sunday morning, he headed to the golf course. It didn’t matter what the weather was like. It could be raining and cold, but Bob didn’t care. It was off to the course. Every single Sunday morning for years. Do you love playing golf? Then you will find our collection of golf jokes delightful! Today, you can have a few giggles with your golf buddies that will surely crack you up all day long.